"Four Window Scenes" is truly one to cherish. 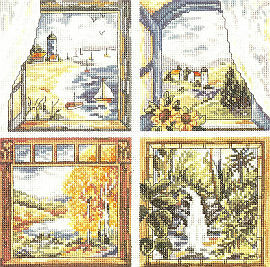 Each window has a scene with beautiful colors and settings for that special time. Summer on the beach with sale boats adrift, or Autumn with its foliage at its best, are just two of four windows. 14-count Aida fabric, 6 strand carded 100% cotton floss, floss card, needle, graph, multi-lingual instructions. Design Size 8.75" x 8.75"